"Not the same bug I posted a while back, this doesn't write garbage to files but actually deletes them.. meaning you can delete application dll's and hope they go look for them in user write-able locations. Or delete stuff used by system services c:\windows\temp and hijack them," the researcher wrote. The PoC exploit has successfully been tested against "fully-patched Windows 10 system" with the latest October 2018 security updates, Server 2016 and Server 2019, but we do not recommend you to run the PoC, as it could crash your operating system. 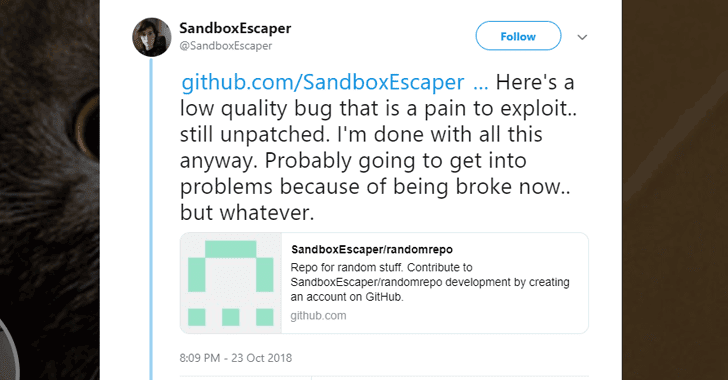 SandboxEscaper's irresponsible disclosure once again has left all Windows users vulnerable to the hackers until the next month's security Patch Tuesday, which is scheduled for November 13, 2018.